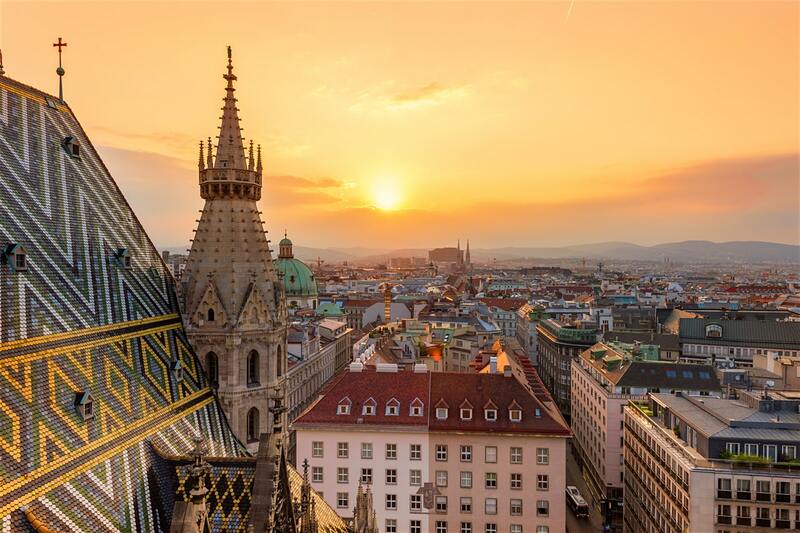 Vienna combines imperial history with post-modernism and is well known for the high quality of life it offers. Besides this it is a true city for innovation and professionalism: the city was ranked 1st globally for its culture of innovation in 2007 and 2008 and between 2005 and 2010. Vienna was the number-one go to destination for international congresses and conventions. From Vienna International Airport (VIE) it takes 20 minutes by car to reach the city centre. (20 kilometres). From the airport the S-Bahn S7 departs twice an hour to Vienna in 25 minutes (direction Wolkersdorf im Weinviertel Bahnhof). Ticket prices vary from €2.40 to €3.90. The City Airport Train takes you to the city centre in 16 minutes for €12.00 max. Vienna is a convenient city for using bicycles. The city runs the Citybike Wien shared-bike program, with bike stands everywhere throughout the city. Bicycles can be taken on carriages marked with a bike symbol on the S-Bahn and U-Bahn. To get across town you can take trains, trams, buses, the underground (U-Bahn) and the S-Bahn regional trains. Services are frequent and you rarely have to wait more than 10 minutes. Transport maps are posted in all U-Bahn stations and at many bus and tram stops. Taxis are reliable and relatively cheap. The historic centre of Vienna is a UNESCO World Heritage Site of itself, next to the Palace and Gardens of Schönbrunn. Other noteworthy places to visit are Riesenrad (ferris wheel), Schloss Belvedere (palace), Stephansdom (cathedral), Staatsoper (architecture) and Hofburg (palace). Vienna has lots of high quality museums such as Kunsthistorisches Museum Vienna, MuseumsQuartier, Leopold Museum and the Kaiserliche Schatzkammer. Moreover, Vienna has a musical heritage you can admire in concerts at the Wiener Musikverein. Last, Vienna has unique coffee houses and a great culinary kitchen. Vienna has countless parks, suitable for walking and running, such as the Stadtpark, the Burggarten, the Volksgarten, the Schlosspark at Schloss Belvedere and the Donaupark. There are also small parks (Beserlparks) in the innercity areas. Every year the Vienna City Marathon takes place in May, attracting 10,000 participants. The marathon starts close to the UNO complex (the site of the United Nation) and ends at the “Universitätsring” in front of Vienna Burgtheater.